PACKAGES: We have a number of yoga retreats to offer you. Yoga & Adventure, Yoga & Rejuvenation, or Yoga & Surfing. See our Anamaya Retreat Packages (ARP) for more information. ADDITIONAL WORKSHOP: Anamaya is so excited to have Laura Green join us this week to teach an additional Acro Yoga workshop. See below for more information. The workshop will take place over 3 days. The price is $60 (or $25 drop-in per class). Emily’s classes are filled with love and inspiration. Discovering Reiki, yoga, meditation, and metaphysical practices in 1997 opened her divine connection to spirit and joy for sharing this bliss with others. As her path has expanded through the years, Emily has become a licensed massage therapist, yoga teacher, wilderness therapy guide, and owner of Summit Lotus yoga and Massage in North Lake Tahoe, California. Her thriving, donation based studio nestled in the Tahoe mountains is her main sanctuary at this time. Extensive studies in the US, India, and Thailand bring a wealth of knowledge to the class experience. Her style is greatly influenced by Buddhism, Tantric philosophy, Anusara alignment, qi gung, shamanic healing, kundalini, vinyasa flow, pranayama, and the rhythms of nature. Every class is a new and enlightening experience weaving the deep connection of breath to our fluid nature. As an athlete, Emily understands the importance of strength, balance, and healing needed to keep the body in alignment with grace. It is our choice how we want to perceive the world and bring intention into our daily lives. Mind awareness and balance in its purest form allows us to tap into the essence of who we truly are. May your journey be rich and full of love. Join us as we gather together to share, connect and play! These three classes of Acro yoga will be a progressive blend of deep therapeutic yoga, thai massage, partner stretching, and gentle Acrobatics. Inspired to help you open your heart to the power of union and the grace of the sacred Divine. As we practice with support, love and kindness for one another, we join as a community and tap into our inner child and remember true play. 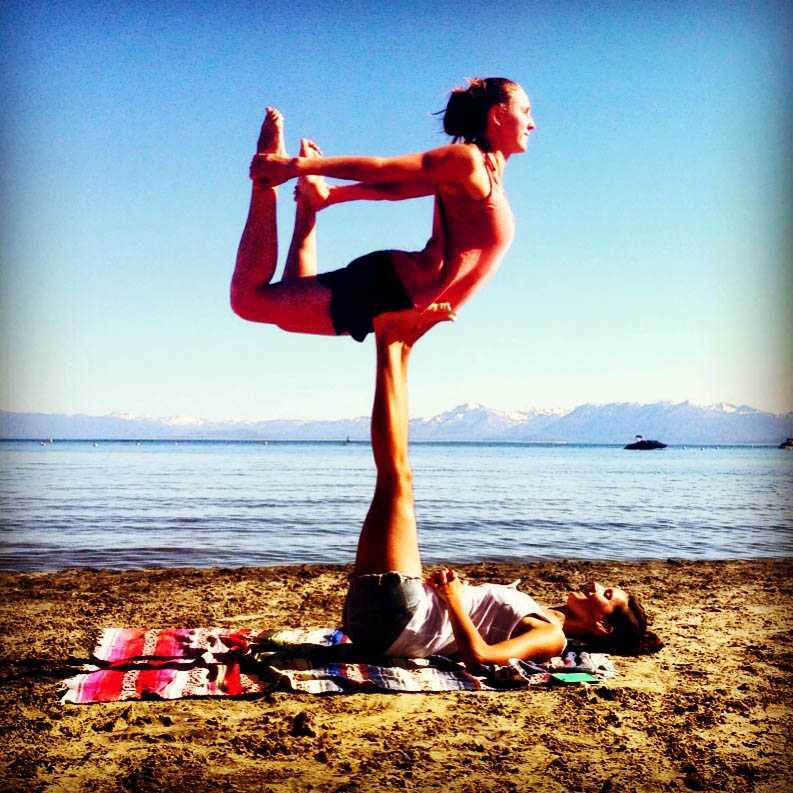 Acro Yoga helps lengthen your spine, alleviate sore muscles, and relax your brain. Learn healing techniques that you can share with your family, friends and community. Laura Green is a certified yoga teacher and Acro Yoga and aerial silk specialist and performer. Training as a nationally competitive gymnast for 15 years, her connection to body movement and energy awareness started at a very young age. She has been practicing yoga on and off the mat for over 15 years, and teaching at various studios in the Lake Tahoe and Oahu, Hawaii area since 2009. Her extensive studies and training in Hatha, Vinyasa, Acro Yoga, Anusara, and Kundalini, has inspired her to teach others and help spark the internal light in all of her students. Having a vast yoga and acrobatic background, Laura’s classes invoke the inner playfulness, creativity, intuitive and healing movement while helping students anchor to their breath and the rhythm of their heart. She finds great value in human connection and opens her classes to tapping into the divine presence in not only one self, but each other as a collective and supportive community. Having been influenced and inspired by various breath, pranayama, and meditation studies, Laura enjoys blending flow with alignment and playfulness with safety. She is overjoyed to join the Anamaya community and share her knowledge of partner stretching, therapeutics and Acro Yoga. Her classes are designed to inspire and help bring a deeper connection to others and our surrounding environment.